Waldo and the Desert Island Adventure is a simple and adventurous story of a boy and a dog. This story is featuring about the imaginary vision of Waldo, the care taker of Michael. 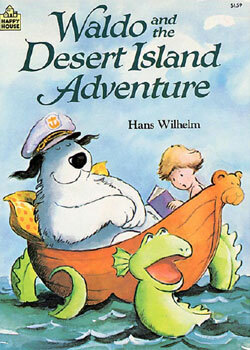 Waldo and Michael embark a journey to the desert island where they battle over the pirates and strange creatures. It was the last day of vacation for Michael. It was raining heavily and Michael wanted to spend some time in the beach. However, he was afraid of the rain. Waldo, the pet and caretaker of Michael offered him an alternative option to go and enjoy in the rain. Michael wore rain coat and stockings to prevent him from getting wet and Waldo accompanied him to the beach carrying an umbrella. They saw boat shaped driftwood left on the shore. They sat on the driftwood and started imagining about having an adventure journey, travelling to Desert Island! As they were wishing, they saw a giant bird approaching them to swallow. However, a sea monster grabbed the bird quickly and swallowed him. Now, the sea monster rushed towards Waldo and the boy. They rushed to reach the shore of the desert island and discovered that it was Pirate’s land. With help of the birds in the desert island, Waldo and Michael defeated all the pirates. They get hold of the enormous treasure buried by the pirates in the island. Soon, Waldo and Michael felt something hot behind them and it was nothing but a monster dragon! They rushed to escape and with help of the Lion, they left the place quickly. After sliding on a water fall, they reached back home. It was still raining, but Michael and Waldo enjoyed their time with so many adventures. 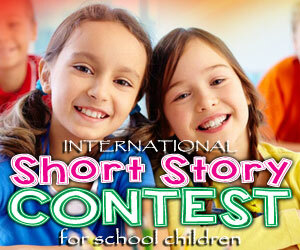 Read this simple feel good story that features all imaginary vision of the dog and the boy. Kids tend to have this kind of vision and wild imagination even for simple elements. Now, read this eBook story for kids, which makes them quite happy. The eBook story features colorful and apt painted images clearly. Grownup children can tell you the story seeing the images.